Upon arrival in Israel, my companions for my final week here expressed their reservation for travelling anywhere much beyond the Church of the Beatitudes/Capernaum – completely understandably, given how much of a 'hot' area this part of Israel has been in recent troubles. During my first stint in Jerusalem way in back in the last days of January, I met with the Guide who was with me on one of my previous Pilgrimages to the Holy Land – Sa’id. 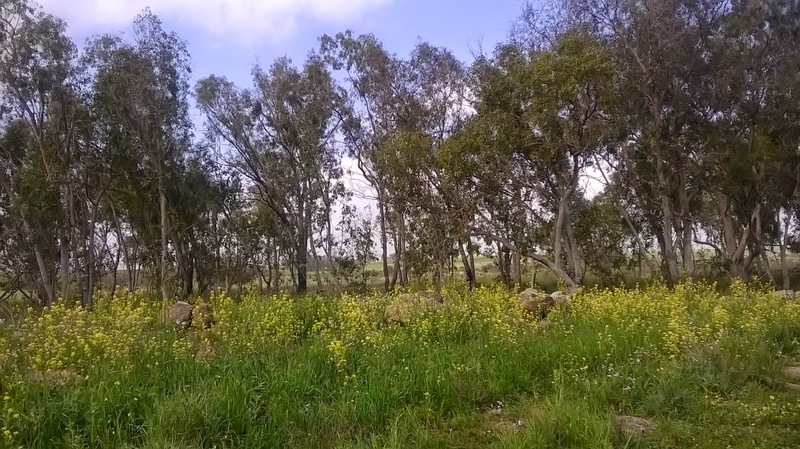 He mentioned that, as I was spending a little more time than usual up in the Galilee, it would be good to visit the Golan Heights as it is a beautiful area…. but to check with someone local as to what the situation was. Having driven around the Sea of Galilee on our first day – and seen just how beautiful it was – one of the party (I shall not reveal which!) 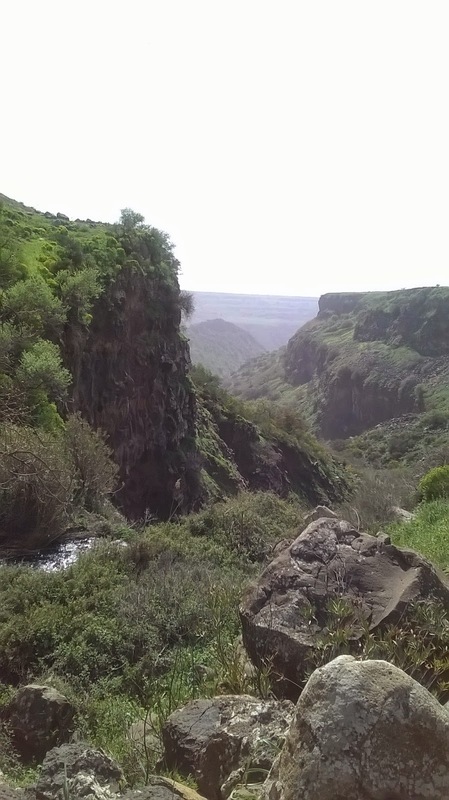 surprised us other two by suggesting it would be good to journey up into the Golan to explore the area. I checked with one of the staff at the hotel and he said it had been very peaceful for a while (he then said two weeks, which didn’t sound like ‘a while’ to us J ) and so, after our jolly sail on the Sea of Galilee) off we went. 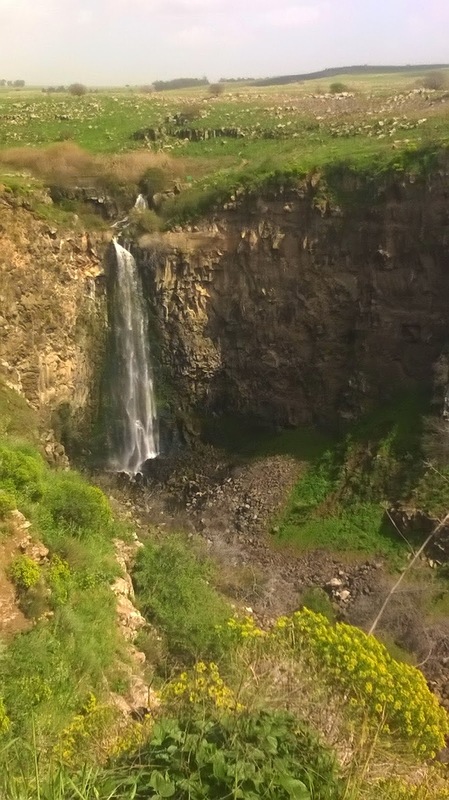 The Golan Heights are beautiful – absolutely beautiful. 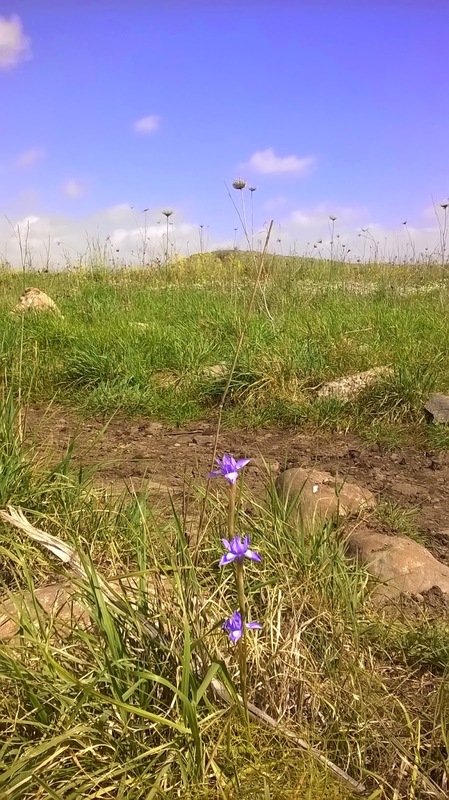 The views across the mountains and valleys are breath-taking and, as with the whole of Palestine and Israel as I have journeyed this last month, the snow and rain means that the Spring flowers are out and the place is ‘alive’ in a way that the arid months of Summer belie as possible. So after the silence there came the cacophony of wildlife that made me laugh and smile with delight at the suddenness of appearance and range of sounds, and the initial sound of the babbling and thundering water, but then there was silence again as we headed over the rise of the other side of the gorge-head until we reached the viewing platform where the sound was tremendous. It was a stunning sight on a beautiful day, and the view down the valley, as the narrow gorge spread out ahead of us was lovely too. Only in Palestine and Israel have I had so many conversations about football though. When we arrived at the viewing platform a family was there, the father of whom was taking a few minutes to meditate to the powerful sound of the crashing water. I didn’t notice him at first as he was laying on the edge of the platform wall. When he sat up, we got into conversation that ranged over my travels, what it was that drew me back to this land… and his favourite football team – Arsenal. I know nothing about football – but he did. His sons love it and play regularly, he is a football coach and he watches football every Saturday afternoon (I didn’t think Jews were allowed to watch football, or do anything, on Saturday afternoons – but maybe it depends on Orthodox/Liberal they are?) This was another of those delightfully surprising moments and conversations that have filled the time that I have been in Palestine and Israel. - I have visited a number of times so there must be something that draws me back (there is). - London is a place that many people have either visited (and loved) or wish to visit because they know people who are there or they have seen it and it looks like a good place to visit (it is). After Gamla we headed up to explore more if this part of Israel – heading towards Golan Winery (we weren’t overly taken with it) the Archaeological Museum where we saw a film that explained the fate of the inhabitants of Gamla many hundreds of years ago when faced with the might of the attacking Romans. It was a community with immense foresight that built its settlement clinging to the side of the ridge as it provided a marvellous defence, alas, the inhabitants ultimately fell to the might of the incoming conquerors of the land. Mass suicide was the route taken to avoid death at the hands of the invading forces – a tragic end to a community that lived in such a beautiful place. Apparently, the FCO website advised that those exploring the Golan Heights should stay to the west of Route 98 (to the east is Syria) and remain at least 5km away from the border with Lebanon. This we dutifully did but, as we enjoyed the peace and beauty of this part of Israel, we could not help but comment – a good number of times – that not so many miles away, just over the peaks of a few mountains, the lives of so many people are being ravaged by both the political machinations of various regimes and the ongoing march of IS into various regions and lands. Whilst we gave thanks for the beauty and the flowers and the lush greenery, prayer was offered for those who simply cannot enjoy any of these for they are facing the struggle to stay alive and remain safe in changing and challenging times. Travelling in the Golan Heights, as with all the travelling over the past month, has made me realise more fully that this is a region of religious devotion that, for some, merges into a fervour that leads to fanaticism. I am a committed person of faith (although sometimes I doubt and question too – but I think (really I know) this is a good thing). I understand that there is a place where devotion to God is so passionate and so heartfelt that it overcomes all else – I have felt it in moments of prayer and worship. The desire for the annihilation of others who do not share my religion is not entirely within my grasp though but, as my father used to say, There but for the grace of God go I. My prayer for this land we call holy and the lands around it has increased in depth of understanding and, whilst I pray that God has it in her/his sights, I pray too that the people who seek for might and rule in this region of our lovely world may seek first the grace of the God we children of Abraham of worship, and that this grace will give way to a love for all humanity rather than a sense of despising those who do not share their views or way of worship. The prayer for peace is deep and heartfelt today. A visit not for the faint-hearted!